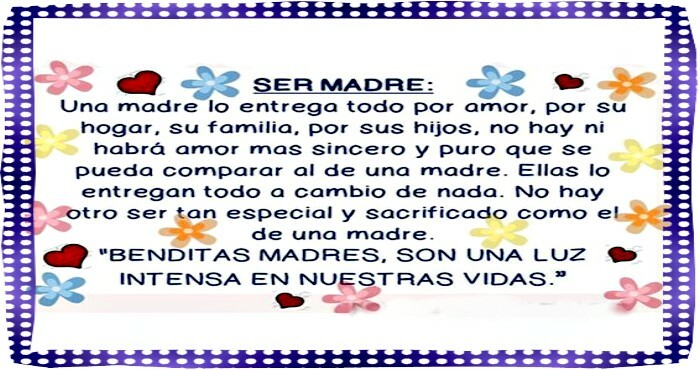 UNA MADRE LO ENTREGA TODO POR AMOR, POR SU HOGAR, SU FAMILIA, POR SUS HIJOS, NO HAY NI HABRÁ AMOR MAS SINCERO Y PURO QUE SE PUEDA COMPARAR AL DE UNA MADRE. ELLAS LO ENTREGAN TODO A CAMBIO DE NADA. NO HAY OTRO SER TAN ESPECIAL Y SACRIFICADO COMO EL DE UNA MADRE. "BENDITAS MADRES, SON UNA LUZ INTENSA EN NUESTRAS VIDAS"